·Overlapping parts to make all seams waterproof. ·Low & wide rain shield to reduce the amount of rain that can blow into the pan during a heavy storm. ·Large pan circumference provides more feeding space for birds, which results in fewer feeders per pen. ·Narrow stepped pan design to reduce the amount of fines that can build up in the pan. ·Six uniquely designed support legs that will not allow feed to block up behind them, preventing mold build up. ·Adjustable feed flow (1 ¼ ” to 3 ¼ ”) opening. ·45° cone to ensure adequate feed flow into the pan. 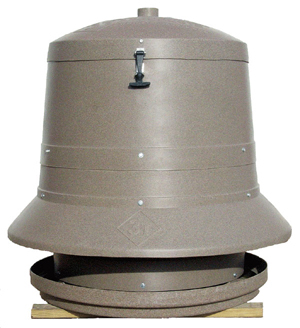 ·Easy to open/close lid that can adapt to fit an automatic feed line. ·Large capacity reduces the number of times you need to fill each feeder. ·27 ½ ” wide opening to allow for easy filling either by hand or with an auger.